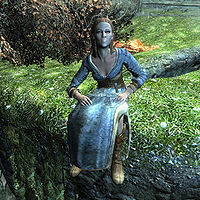 Asta is a Nord worshipper of Kynareth who walks around in Eldergleam Sanctuary. She wears clothes and a pair of boots, and is equipped with a leveled dagger and a leveled bow with leveled arrows, all of which may be up to elven in quality. She also carries at least eight gold. If you pierce the Eldergleam's trunk with the weapon Nettlebane to siphon off some sap, you will be identified as a "thief" by Asta. Asta may be killed by spriggans if you pierce the Eldergleam tree with Nettlebane. Despite the fact that taking sap from the Eldergleam gives you no bounty, it still counts as theft and Asta may send hired thugs after you. She is a member of the bandit class, which determines the level of her skills. If she is killed during The Blessings of Nature, her body will persist indefinitely due to missing stages in the quest script to track her death. She is a unique NPC and is therefore unnecessarily flagged to respawn in the game data. This page was last modified on 27 August 2015, at 17:51.